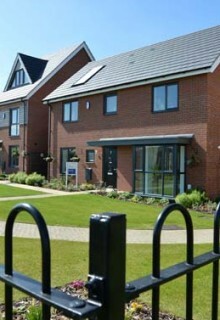 Newton Grange is located in Cambourne, Cambridgeshire and forms one phase of a far larger development of the area. The development achieved a Code for Sustainable Homes Level 3 strategy as well as compliance with Part L1A 2010. Our assessment services provided for this development included Code for Sustainable Homes assessment, Part L1A assessment and production of Energy Performance Certificates (EPCs) and assessment of internal daylighting standards. The energy strategy involved achieving Part L1A 2010 standards without the use of renewable technologies. This was made possible through detailed assessment of the building fabric, including close attention to detail on reducing heat loss through thermal bridging. Compliance with the Code for Sustainable Homes Level 3 has been achieved through excellent fabric energy performance, sound insulation, improved potable water efficiency, good standards of internal daylighting, reducing the impacts of construction on the neighboring area and wider environment as well as ensuring construction materials were selected to minimise environmental impact.